Listen in as Johnnie and Johanne talk about escaping personal imprisonment. Whether it be an abusive relationship, an addiction or even a compulsion to anything that may keep us from living our purpose. 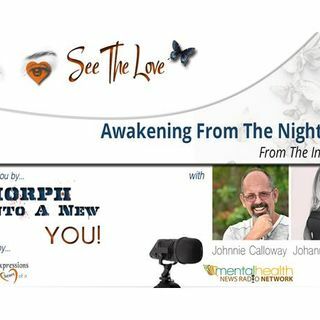 They discuss how we need to identify what love means to us which ties into changing your thoughts to change your life! Johanne is a powerful woman from Ontario, Canada. She is a survivor of nearly two decades of domestic violence abroad. She is an advocate for women’s empowerment and helps ... See More people worldwide break FREE from abusive relationships. As an author, speaker, & consultant, her message is indisputable and profound. She has combated years of PTSD, anxiety, and two major depressive episodes. She has had years of intensive treatment and extensive interpersonal therapy & has overcome obstacles many have never fathomed. She has endured 17 surgeries, 2 near death. With the help of her family, she successfully represented herself in court after being in debt for $30k from legal fees in order to protect her children. Johanne is passionate about helping women empower each other, and building a support system. She strives to help women to become authentic and find their true selves again through love, perseverance, and compassion for themselves and each other. She also helps women develop a bullet proof mindset coupled with listening to their intuition, which is the one thing that you can trust, after trust has been broken.